You don't need much to get started. Some means of measuring. You can use a good balance (scales) by working with the densities of the liquids but this is more fiddly - but faster once you get into the way of it. Bottles to put the juice in. Most of us probably have a ton of 10ml bottles. I prefer the squidgy ones as they will survive boiling. If they are tainted by what was in them last, put them in a bucket with some bleach then rinse them well till you can't smell the bleach any more. The simplest good precision measuring device you can get is the standard syringe. 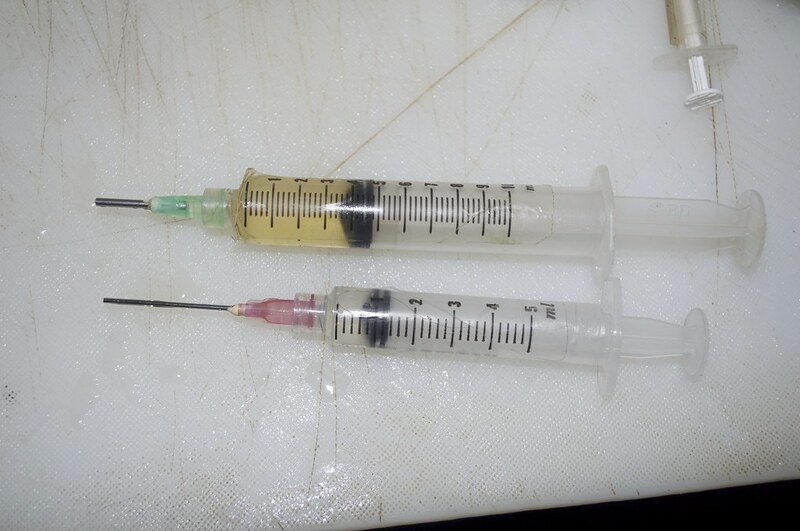 For most domestic scale mixing a 1ml, a 5ml and a 10ml syringe will be fine. They are designed to be single use so will need replacing two or three times a year but they aren't expensive. You can find loads of them on eBay. A couple of blunt needles - one in 14 gauge for measuring VG and similar thick liquids and a longer, finer gauge one for PG and flavours. If you can find filling cannula on eBay, they are ideal for the thinner liquids. But don't pay collector's prices for them. A place to work well away from kids and pets. Remember VG tastes sweet and with nicotine ad flavours in it it could be attractive to kids and dogs (Cats can't taste sweet so are unlikely to be interested). Don't allow them anywhere near it. Kids and animals have been poisoned by nicotine - don't let yours be next. A place that kids and pets can't get to for storing the supplies. You'll need flavours and VG and PG though I've not used 200ml of PG in a year. Some recipes. There's a good selection in the Recipes sub-forum. Sticky labels and a pen and bit of paper. A freezer for longer term storage of nicotine. This is likely to be highly unpopular with spouses though. The first rule of mixing is: Keep It Clean. The Second Rule is: Keep It Clean. The Third Rule is: Mop up spills immediately. Remember, you are inhaling the result so cleanliness is essential. Also remember nicotine is poisonous - but like all poisons it is the dose that makes the poison. Everyone reading this is likely to have a body that is used to constant administration of nicotine for years. If you're reading this it is highly likely that you haven't died. So don't worry about that. But make sure that kids, animals, fish, whatever can't get to it. It is absorbed through the skin so don't go spilling the stuff. 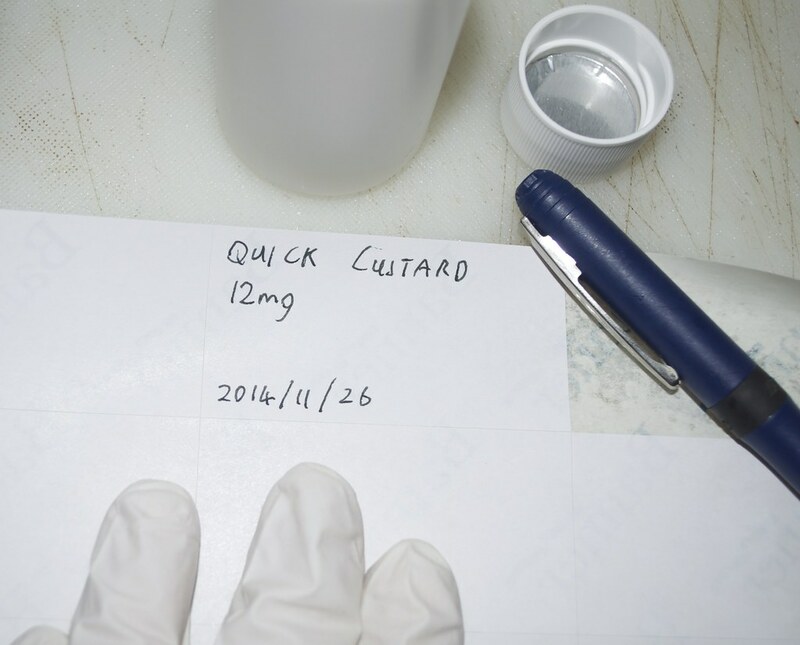 Nitrile gloves are much less permeable to nicotine than latex ones and aren't violently allergenic the way latex ones are. They cost pennies a pair. Get some and use them. If, like me you are a messy worker, consider disposable polythene aprons. They aren't vital but you don't want to get any more nic on your skin than you can help. Most of you have probably spilled juice on yourselves at one time or another though. So it isn't a big worry really. But do mop up spillage immediately. I use an old HDPE chopping board to mix on. Before mixing for anyone else I give it a scrub down with bleach (Which is where gloves are a good idea). Don't use thickened bleach as used in toilets, you want the cheap thin stuff. I'll only use bottles that can be boiled. For my own use I don't boil them but I do for others' use. A bit of paper with the quantities worked out for each ingredient. This will help prevent a lot of mistakes if you can refer to the recipe easily and have already worked out the quantities. There are loads of online mixing calculators available. A means of measuring out your ingredients. So we get started. 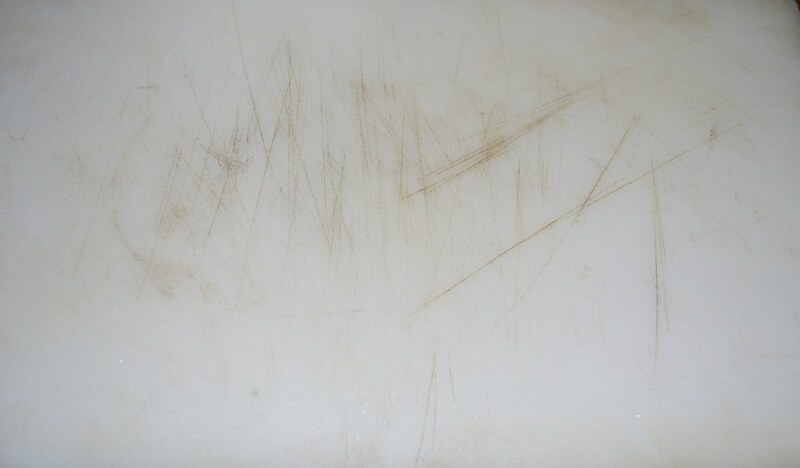 The many old chopping board gets dug out and scrubbed with bleach. I like the smell of bleach. Then I dig out my measuring devices. 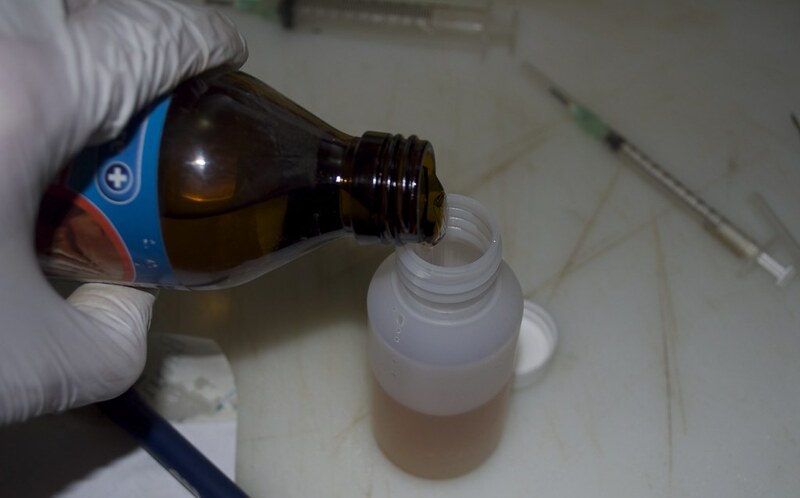 Syringes are a cheap and easy way of reasonably accurately measuring out liquids. the former chemist in me is screaming, "No they aren't" but they are plenty accurate for our purposes. 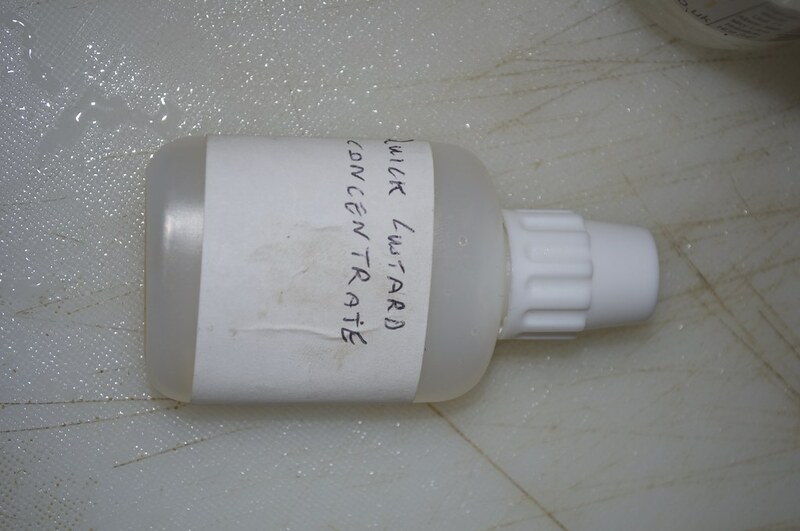 I prefer to use Luer Lock ads opposed to the more common Luer Slip syringes as VG is pretty thick stuff. PG is a fair bit thicker than water too. Wide bore blunt needles are handy for measuring out VG. Narrower bore and longer blunt needles are handy for getting stuff out of nearly empty bottles of flavour and the like. 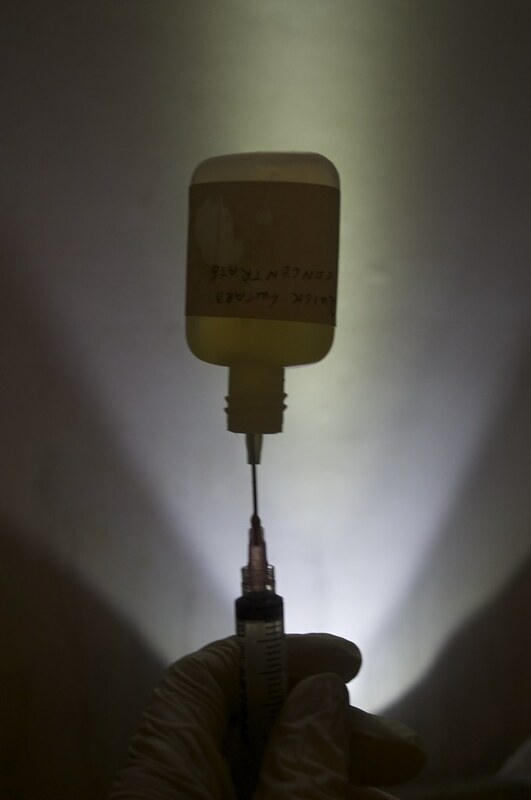 Both PG and VG will dissolve off the markings on standard plastic syringes. They will also eventually harder the rubber plunger and they'll stop working. But this is hardly a surprise as they are designed to be strictly single-use devices. Do not use sharps as for injection. You will stab yourself at the worst possible moment. The solution to the loss of markings is to tape over the markings - 3M Magic Tape or its much cheaper Staples clone work just fine for this. 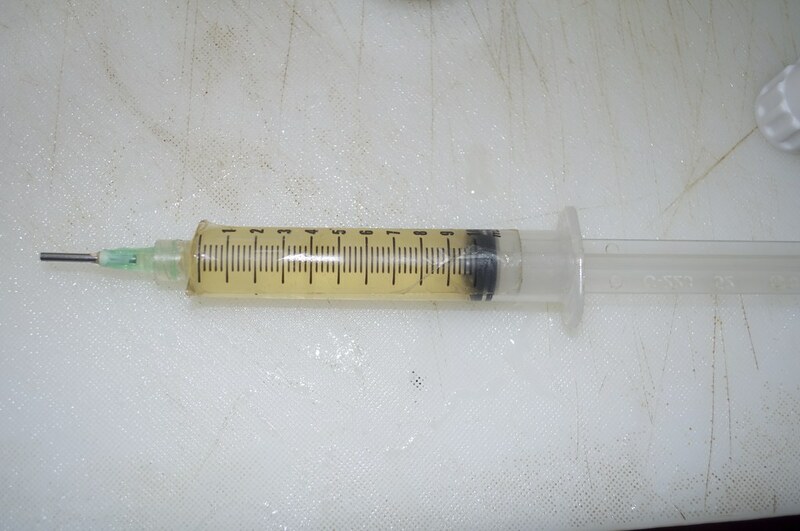 I'd just tossed a 5ml syringe that was worn out so there's a shiny new sterile one. Which needed the markings taped over. 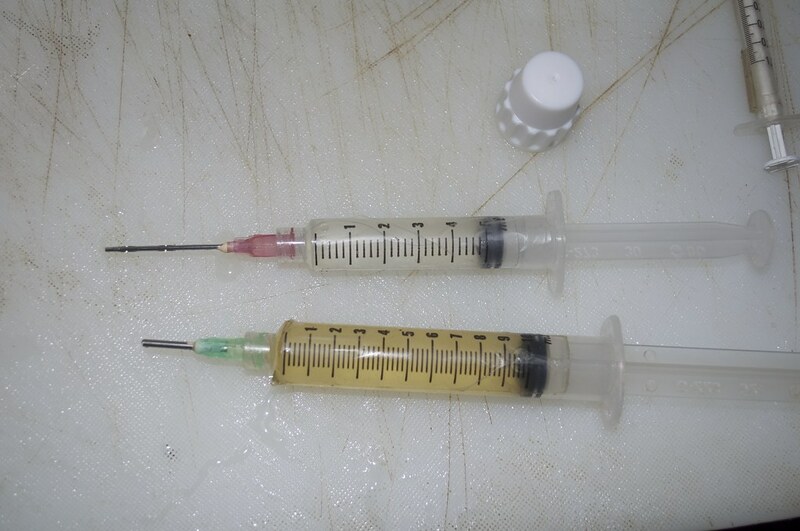 I rinse out the syringes with very hot water after each use - you don't want flavours contaminating one another. 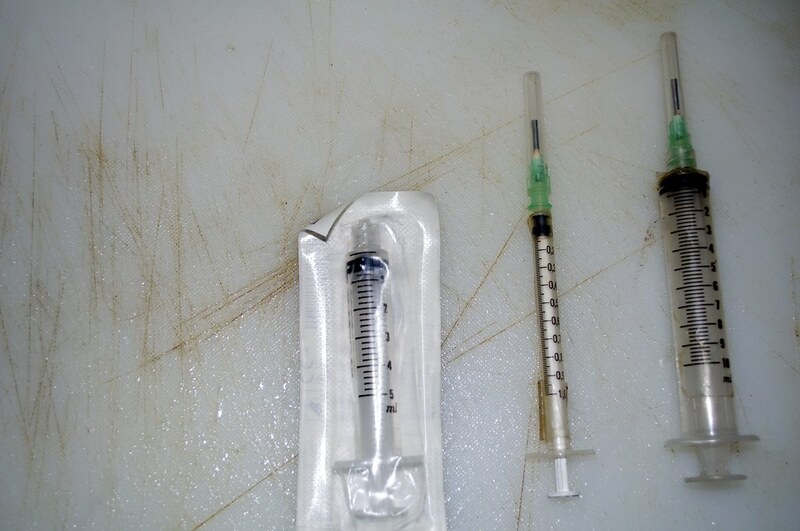 You could mark them for a specific ingredient but you'd need an awful lot of syringes. Now we dig out the ingredients. 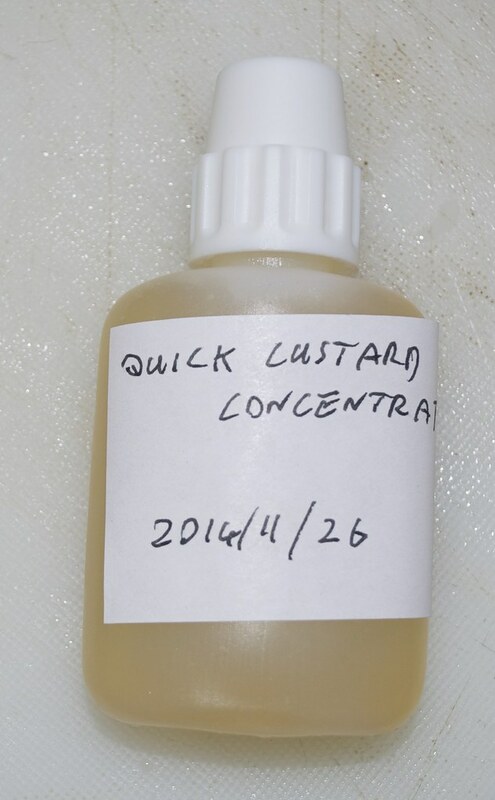 I'm making Quick Custard concentrate. Since I tend to keep a stock of it lying around I'm mixing up a fair amount. I know that I mix them at 4 parts vanilla to one part cream. I'm using a 30ml bottle that will hold 35ml filled to the brim. 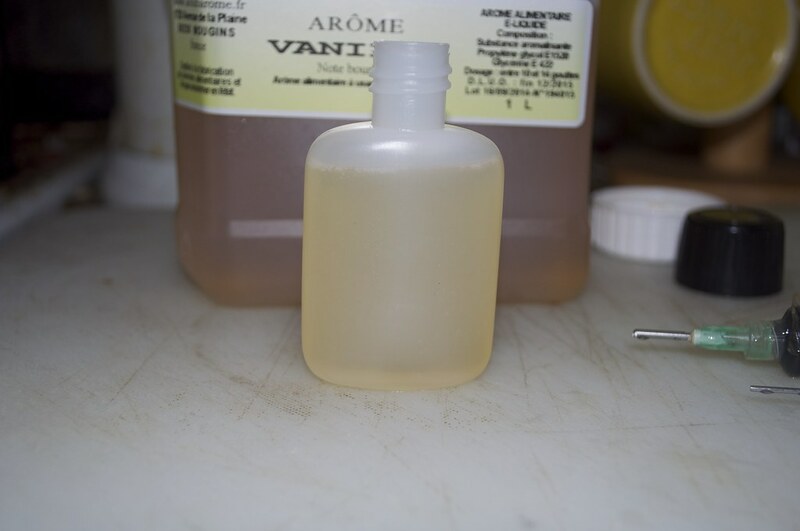 Then I draw up 4ml of vanilla and 1ml of cream and repeat till the bottle is full. This is what 30ml looks like in the 30ml bottles I use. Fill it right up and label it. Now to mix up some juice. I start by writing out the label then I remembered that I was mixing this lot for someone who vapes at 24mg. So I work out the nicotine. To mix up 100ml of 24mg juice I need 100x24 mg of nicotine or 2400mg of nicotine. The nicotine is at 72mg/ml strength so I need 2400mg/72mg/ml = 33.3ml of nic. so I draw that up and toss it in the bottle. 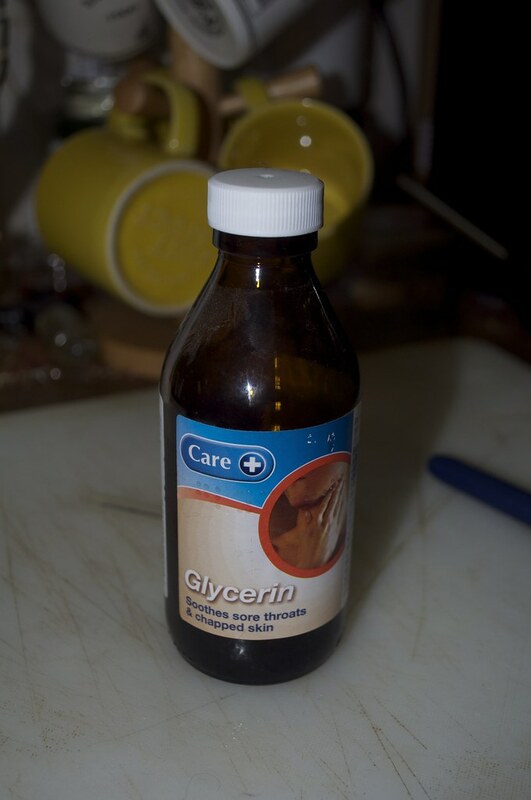 I use 20% flavouring - you can get away with much weaker if you use PG to dilute it or if you let it steep. 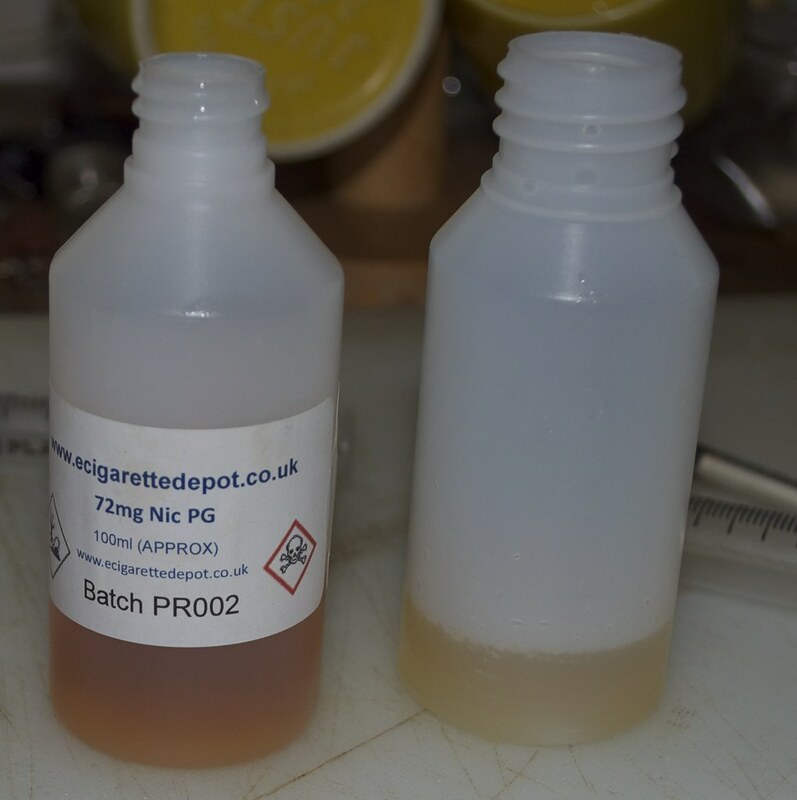 PG carries flavour better than VG so the more PG (Within reason) the less flavouring you need. You could probably get away with 12-15% flavouring in a 64:40 PG:VG mix but I wouldn't want to vape it. So I need 20ml of flavouring. Using a narrow needle I can stick it into the drip cap of the bottle and draw it up. This won't leak with the bottle upside down which makes it easier to draw up the last drop. So there's the 100ml bottle with 20ml of flavour tossed in it. Then the nic. So I get my VG - this lot came from my local pharmacy - which took ages as everyone else in there was complaining about their methadone being late. Put the cap on - give it a shake and it's ready to vape. DON'T FORGET TO LABEL IT!!!!!! I'll add to this as ideas come to me or questions and complaints are taken account of. So this is a 100% VG mix? (04-05-2015 04:59 PM)Cloudwalker Wrote: So this is a 100% VG mix? 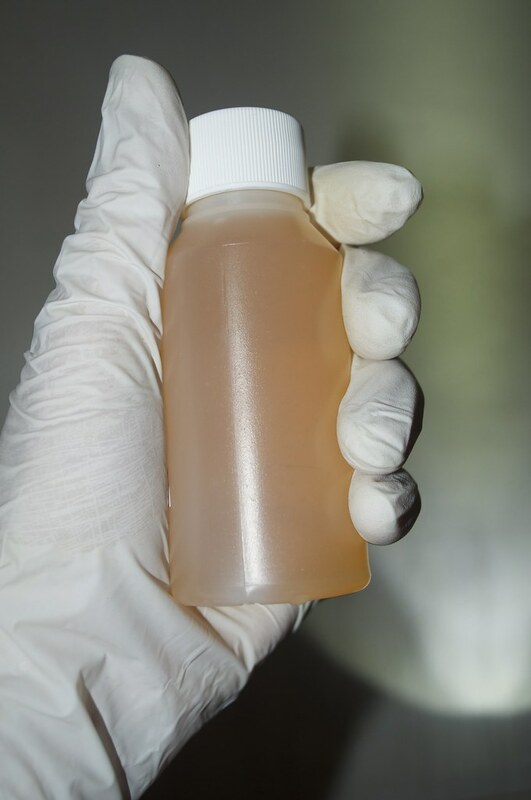 It is hard to get much more than 85% VG as just about every flavour that is safe to vape is dissolved in PG. PG carries flavour much better than VG though you can get some flavours in VG. 80% VG works well for me. I am one of the few i suppose that actually prefers much more PG than VG in my mixes. I'm not all that bothered by higher PG if I like the juice. One of my once in a while treats is 60% PG. But in general I prefer very much more VG. Hi everyone. Well I seem to have everything I need for my first mix. I wanted to share with everyone that I downloaded this really cool App. It's called "Liquix". You plug in your numbers and it calculates. very Cool. What I am interested in is "steeping". I have of course watched several videos on the subject. Don, can you give me the run down on steeping, and a technique? I am hearing one week and as much as three weeks. I am hearing cap on and cap off.